The good news is that Europe has just woken up, so to speak, and it is prepared to intervene. …according to Vinje, most relevant to the Internet and work done at the IGF, was the problem of growing .NET-dependency for web applications. .NET is Microsoft’s platform for web applications software development. “It is a sort of an effort to ‘proprietise’ the Internet,” said Vinje..
Wow, the picture shows again that you are a man of real taste. If I was your prospective future employer and had just found this website your name would be off my list now. It might be prejudice but I have found that only Americans can be that bluntly in bad, primitive taste. Bah. Yuck. Justin Steinmann’s comment, from the same site. Pamela is just a very difficult person, that’s all. Unfortunately, .NET is based on an ECMA-standard, so I don’t give that claim much of a chance in court. As much as I like to see Microsoft clobbered. eet, It is nice that you buy the whole ECMA-standard stuff. But it is quite foolish or misinformed. For one, System.Windows.Forms is not covered as part of the standard. For two silverlight is also dependant of a number of codecs that are ultra proprietary, want more examples? Novell uses FUD and false advertisement, you know? It is not true that SUSE enterprise works better with windows than Red Hat, but that’s Novell’s main selling point right now. Red Hat’s developers get paid totally well AND have the respect of the community, I am unsure why Novell had such need to make a pact with a company that even to date is an abusing monopoly that fights Linux with FUD and other anticompetitive tactics. Regarding your attempts to become political correctness police, I have no comment. That’s why these parts are kept strictly separate from the rest of Mono. Wrooong; you can use any video or audio codec that you want with; you can for example compile a version with only Ogg Vorbis and Theora. Codecs are not integral; you can use GStreamer, for example, or Xine. Get your facts straight before accusing others of being uninformed, son. We all know all Microsoft formats are “BASED” in standards, only after being EEEd by MSFT. ECMA-standards, despite its misleading name, are not necessarily standards. In some cases (as in the case of Microsoft’s throat-fed formats) are not standards AT ALL. ECMA is no less than a private company that helps other companies to push their proposals through TRUE standarization bodies (ANSI, ISO, IEC), for a fee, while trying to guarantee a faster approval process and that the format won´t be modified by the true standarisation process. quality as well: Better a good standard today than a perfect one tomorrow! Anyway, independently of ECMA’s nature, no format supported by a single vendor (and its cronies) deserves be called “standard”. 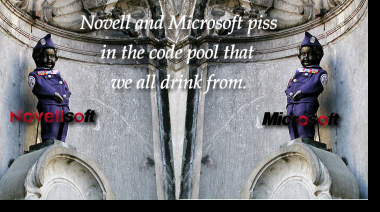 IMHO, Novell accepted the pact with the devil due to serious financial problems. The 348 million dollar deal allowed them some relief. Microsoft is very smart when they target struggling companies… the timing was perfect. JUST ONE MONTH before the pact Novell was about to be delisted from Nasdaq and was having problems with the Wells Fargo Bank. I think the re-animator injection of 348 million by Microsoft converted Novell in the perfect zombie to perform its masters at Redmond commands. SubSonica, I can’t recall ever seeing this article. It’s worth a separate post. Mind if I do (post about it)? 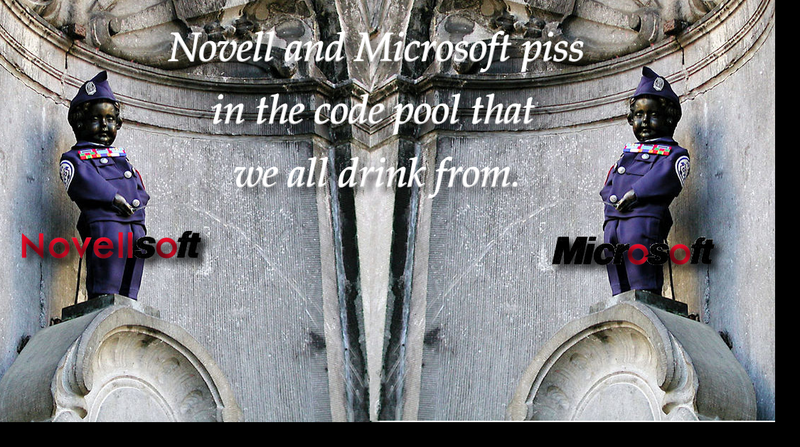 Bear in mind that Novell spoke to Microsoft since around May. When I first knew that Novell was in financial hardship, I regreted it since I was closely following all the fiaSCO case and also watching the maneovers of the big software corporations about pushinf the US software patents regime in the EU. and I thought Novell was a powerful ally to FOSS due to its big patent portfolio that could defensively prevent Microsoft and other giants’ (SAP, Oracle, Siemens) aggresive attitude towards FOSS. When they caved it to Microsoft IP infringement claims, lamely “agreeing to disagree” I knew that it was the price of Novell’s so-badly-needed 348 million dollars. It’s not even about ECMA and what means to be a standard. It’s not even about patents. But I don’t need EXE and DLL files on my Linux box — and Mono clones .NET that much that you’ll have at least a few dozens of EXE and DLL files! Also, I don’t need a reimplementation of a Microsoft technology (note: it’s not like Samba, which is needed for real interoperability) that WAS NOT NEEDED, NOR REQUIRED. For small gizmos to use with GNOME, there is PyGtk, should it be that complicated to use C or C++ (Gtkmm) — although for crap like Tomboy or Beagle you could have used just about anything. There isn’t ANY SINGLE MAJOR MONO APPLICATION that would justify the existence of Mono. Mono is bloat, and a capitulation to a Microsoft “technology”.